The heat continues, but the fun does not stop! Today the crew started another big project under Boss' (Isaac's) direction - a rock and cement retaining wall in front of the house. 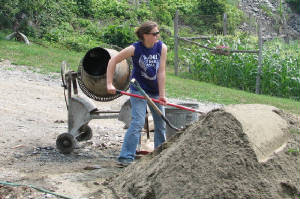 Sister Hannah not only assembled the new wheelbarrow, but also mixed all the cement and put it into the wheelbarrow.